Blue-gray clouds darken the skies and the smell of ozone permeates the air. The beating of thunderous wings and an actinic glow, often the first and last thing your enemies see, are the heralds of the Electro Dragon! Not only is this new troop one of the largest ever, the Electro Dragon can soak up a moderate amount of damage and dish out punishment that’ll make enemy villages quiver in fear. All that remains after the Dragon’s passing is a lambent glimmer of destruction, for the Electro Dragon spits bolts of lightning that bounce from target to target. But it doesn’t stop when it hits its first troop or building! The Electro Dragon’s lightning breath weapon will strike its target and will continue along its path, chain-linking up to 5 different targets whether it’s an enemy defense or enemy troop. Each arc of lightning reduces in damage after the previous arc. Bloated with the power of the cyclonic skies, the Electro Dragon is endowed with ionized potential. Once the Electro Dragon receives fatal damage, it releases its stored energy as a final hail of lightning bolts to remind you why he’s the king of storms. This massive member of the Dragon family, arrives with the release of Town Hall 12; the first new troop for the Home Village in more than 2 years! 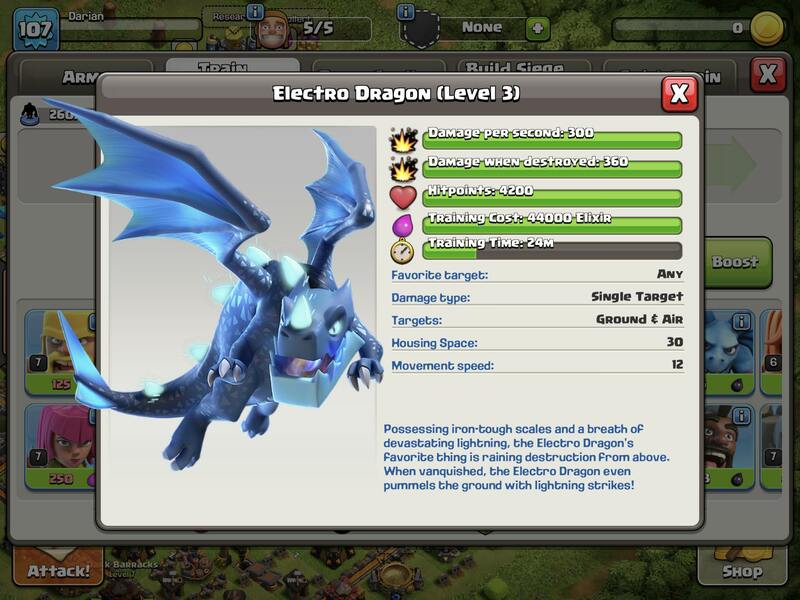 Available for players from TH11 and up, the Electro Dragon unlocks when you upgrade your Barracks to level 13.